I wasn’t even sure where to start. I checked out the Common Sense Media lessons, and decided to give it a shot. Since then, it’s a constant growing and learning process. In the 2015-2016 school year, I taught my way to becoming a Common Sense Media Certified Educator. I implemented Common Sense Media lessons in my AVID 7 classes, had discussions in my Science 7 classes, and ran a few parent engagement opportunities (including a presentation from our School Resource Officer, sent home CSM Family Tip Sheets, and posted resources on the school website). Now, the process is much more streamlined and simplified. Teachers must complete 2 hours of learning (digital citizenship + digital teaching), 2 hours of teaching, and write a reflection. Plus, they ask that you join the Common Sense Educators group on Facebook–this is a phenomenal community of dedicated and inquisitive teachers. For the past 2 years, I’ve upped my game, and extended my certification to become a Common Sense Ambassador. I love the access to extra professional development, resources, and encouragement to share digital citizenship with my PLN. This school year, I finally got everything together to get us ready to become a Common Sense Media Certified School! As of right now (February 2018), we are in the process of completing our certification requirements. The requirements are similar to that of the certified educator program, just on a school-wide basis. We are teaching 5+ lessons across 2 grade levels, engaging parents/families in at least 3 ways, and I am providing PD to all our teachers. All 4 core content classes (math, English, science, history) plus PE are teaching lessons. Our elective teachers are teaching lessons if they choose to. I presented at our district’s Middle School Instructional Showcase on how we’re implementing digital citizenship lessons at our school. It is essential to note here that we have two self-contained special education classes. And, these classes are participating too. I am teaching four lessons from the K-2 curriculum to each class. It’s developmentally and academically appropriate for these students, and the teachers and I are differentiating as needed. Many of our students in moderate-severe will have cell phones in the future and regularly use tablets and computers. Our students in the moderate class frequently play video games online (including PS4, XBox, etc) and many already have cell phones. Each department and grade level is responsible for one 45 minute lesson. I used the Common Sense Media lessons and turned them into Pear Deck presentations (read more about how Pear Deck engages students!) that incorporate some content too. The reason I did all the leg work here is to build buy-in from my teachers; the majority are more likely to implement these lessons if they can just project and go. As I shared these lessons with each individual department during our weekly PLC meeting, I saw faces perk up, both for the content and Pear Deck. I am also using our poster printer to print Common Sense Media posters for any interested teachers. I created a Google Form for teachers to put in their requests, and I will print and deliver the posters in the next couple weeks. Similarly to when I completed my CSM Certified Educator certification, we are engaging families with a presentation from the School Resource Officer, sending home digital & paper copies of the Family Tip Sheets, and hosting Parent Tech Breakfasts to talk about digital citizenship. Cyberbullying and digital citizenship are issues on our campus, and I am confident our students will benefit. We are going to have our certification complete before the end of the school year. I set a goal to have all lessons taught before spring break, and I will complete the certification application after spring break. I am packaging up the lessons I created on Pear Deck and compiling some additional resources so the rest of the middle schools in my district can implement what we are already doing. In the next few years, we’re going to become a Common Sense Media Certified District! How do you address and implement digital citizenship in your classroom and school? Pear Deck is an “AND” not an “OR” for me. It seamlessly integrates into what I’m already doing in my classroom, rather than something extra to implement. We are 1:1 iPad, and my kids had no problem joining into a session. After using Pear Deck a couple times, I asked my students what they thought. Overwhelmingly, they liked it! For my students in the back, they were able to see what I had projected. And, it made it easier for them to take Cornell Notes. Assignment instructions were right in front of them, eliminating excuses for not knowing what to do. The Google Slides Add-on was a total game changer. My only initial frustration with Pear Deck was editing my slides after I had imported them into Pear Deck–I always make mistakes (sorry 1st period). This was 100% fixed with the new add-on! Interactive question, asking students about gender stereotypes. Across the board, their answers for math were surprising! Led to a great discussion. Bigger bonus: our IT department pushed out the add-on to all teachers this week! That’s huge! I’m hoping it’ll up the usage district-wide, and provide more opportunities for engagement. Some of our high school teachers are huge Pear Deck fans, and my fingers are crossed that (1) more will get on board, which means (2) more effective & engaging use of 1:1 laptops in high school. For a teacher looking for a way to begin to integrate technology, Pear Deck is an excellent starting point. I project from a laptop, but can have the presenter dashboard on my iPad. This frees me up to walk around the room, while checking in on student responses. It’s easier to interact when I’m not tied to the front of the room. Teaching feels more conversational when it can happen anywhere in our room. Seeing student responses in real time on the presenter dashboard (premium version — 100% worth it!) makes it’s easy to address misconceptions or student questions. I can also check for understanding by adding in questions on the fly. It gives every student a voice, especially the introverts. Reading their responses followed by simple eye contact makes them feel valued and heard, without them saying a word! I get so many returned smiles when I read a response and give a silent thumbs up from across the room. The premade interactive Slide templates make it ridiculously easy to up student engagement! Student-paced mode is a life saver when I unexpectedly have to be out. I got called in for Jury Duty last week, and had to quickly adapt my Wednesday plans to work for a sub on Thursday (block schedule). With student-paced mode, my kids were able to login and complete the lesson. I went in later to check their responses. And of course, a highlight of my ISTE 2017 experience was meeting this dancing Pear at the Pear Deck booth! The people. The people who work for Pear Deck are the kindest individuals, both those I’ve hung out with in person and those I’ve met on the Twitters. Knowing they’re approachable, willing to answer questions, receive feedback, and hear how I’m using Pear Deck in my classroom makes me want to use it and spread the word. The personal touch is the huge difference! Thank you, Pear Deck, for being awesome humans who care about our students and teachers! What are your favorite tips and tricks with Pear Deck? Parent involvement is a huge mystery to me. Within the context of my school, I’ve learned that many of our students’ parents were once students at our school, and have not so positive memories of their time in middle school. That coupled with busy work schedules makes it difficult to get parents to come to school for events. I’d like to take a moment to recognize that we do have some incredible parents who show up, volunteer, and are involved in our school. I’m so thankful for them. Every time I call parents, mostly positive phone calls with occasional behavior concerns, I reach friendly and caring parents. I know we have the support of our parents at home. 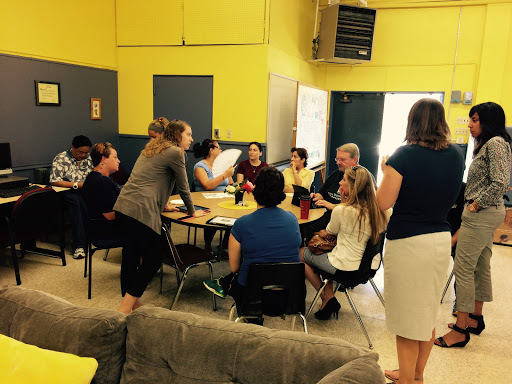 Last school year, I started hosting monthly Parent Tech Breakfasts. We’re 1:1 iPads, and we have lots of repeated questions from parents on how students use iPads at school, and how parents can more easily access technology for themselves. The set-up is simple: we provide coffee and breakfast pastries, and we talk about technology for 30-45 minutes. Since we have many Spanish-speaking parents, I usually have a fluent Spanish-speaking techy teacher present to translate and/or run a parallel group. Each month, I invite content teachers to join us as well. My Viking Tech Crew students have joined us a few times to show off tutorial videos and share projects they’ve created in their academic classes. – Google Apps for Education — we had parents on my Chromebooks experiencing collaborative Docs for the first time! Even though it’s a fairly simple event to plan, there is a lot that happens behind the scenes. I couldn’t do it without our Coordinator of Intervention Services, or as I call her, Facilitator of Awesome. Her job includes bridging the divide between home and school, and supporting students academically. She sends out reminder emails and phone calls to parents, shops for the goodies, and gets the room read for parents. We host the Parent Tech Breakfast in her room, which is a parent-center, office, and conference space. I’m thankful that we’ve been able to reach parents and families through the Parent Tech Breakfast! I’m always looking for new ways to connect with parents and families. How have you/your school successfully reached out to parents? Sometimes, I’m horribly disorganized. Ok, a lot of time I’m disorganized. Over the summer, I got fed up with the black hole that is my work email, and reached out to a few people on Twitter for help. Big shoutout to Amy Illingworth and Joe Young for providing resources and guidance! Inbox Zero is based on a principles: “process email, rather than check email” and be intentional about responding and relocating emails. For more serious info, check out this summary of Merlin Mann’s Google Tech Talk about Inbox Zero. My first thoughts were, “this is impossible!” — and with that attitude, it is. After considering Inbox Zero for a couple weeks, I realized that I need to shift my email habits. Old habit: My bad habit in the past was to have email open on my computer all day long, and look at everything as it came in. Yes, those notifications on the top right of my computer were very distracti…squirrel! The problem was, I never actually replied to the emails, so they would get buried. New habit: Email stays closed, unless I’m actively looking at my email, responding, deleting, and filing. Old habit: Everything stays in my inbox, until I throw up my arms and have a email deleting party with myself for an hour on a Saturday morning. Oh hey, there’s that email from 6 months ago! New habit: Every email gets deleted immediately, replied to, and/or read and moved to a folder. Old habit: See above. Black hole. And feeling of adult incompetence for losing important emails. New habit: Nothing in my inbox! It’s like a huge weight lifted off of me.I’ve been in school for 9 weeks, and I’ve maintained this Inbox Zero habit! Remember, whenever you read about someone else’s habits, you have to keep your own personality and strengths in mind. Just because the above method and tips work for me doesn’t mean they’ll be perfect for you. Take it and make it your own. If you have an email tip, please share it with me.Now, in all efforts of transparency, my personal email is still a disaster….that’s the next habit-changing email project! I don’t know where to start with CUE 2016. This is the first conference where I’ve actually looked forward to the social events, and these were the defining events for me this year. As an introvert, conferences are intimidating when I have to talk to and be around so many people all day, so all I want to do after the sessions is go back to my hotel and read and sleep. 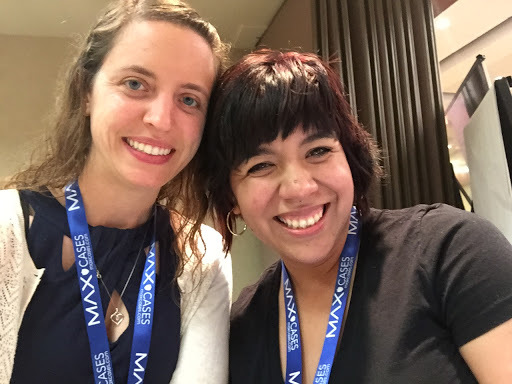 CUE was different–I was so excited to meet and connect with many of my Twitter friends in real life! Rewinding a bit: I attended EdCamp Sillicon Valley on February 27th, which was one of the first times I had actively sought out Twitter friends in real life (including the one and only Justin Birckbichler, my EduRoadTrip co-host, FlyHighFri co-creator, Teach20s co-creator, and bestie). Then, last weekend, I presented at a GAFE Summit in Pomona, CA. Walking in the first day, Ari Flewelling was the only person I had actually met in real life. By the end of the day, I had dozens of new friends, and really felt like part of the larger edtech community. Why was I walking around with a unicorn at CUE? Did you see me walking around with my unicorn? 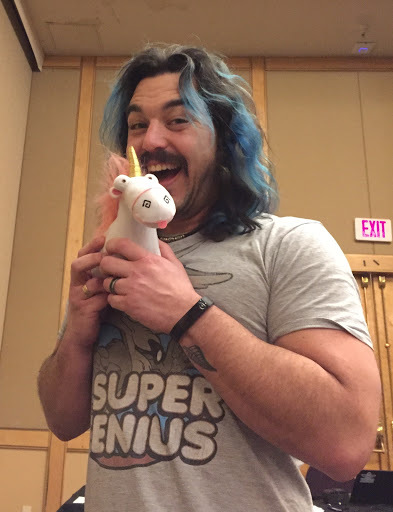 Here’s the back story: Last Sunday night I co-modded #CAedchat with Ryan Archer and I mis-read Craig Yen’s tweet about the uncon–it looked like unicorn! Since people kept tagging me in pictures of unicorns, I had to buy one to bring to CUE with me. Fluffy is my unicorn, and you can find her on Twitter (@imsofluffyyyy). She and I vlogged throughout the whole conference which was an entirely new and different experience for me. For an introvert like me, this was an excellent conversation starter! All this positive momentum carried me into the CUE Conference in Palm Springs. There were so many people I looked forward to meeting and seeing, both in sessions and at the meet-ups. 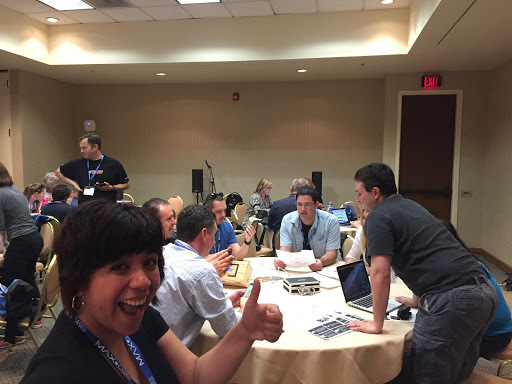 On Thursday, I went to the #CAedchat LIVE! chat and session. I missed it last year because I was presenting at the same time, so this year was much anticipated. Usually I’d resist a session where we have to actually talk to each other (I’m an introvert, remember), but this was an engaging and thought-provoking discussion. We were in groups for 5-10, and discussed the question first before tweeting out our replies. And, of course, I got to hang out with THE Craig Yen! Thursday night is one of my favorite parts of CUE each year. Alicia Johal, my conference buddy and teacher friend, and I go to the Thursday night street fair every year to walk around, peruse the different vendors, and ultimately find some dessert. 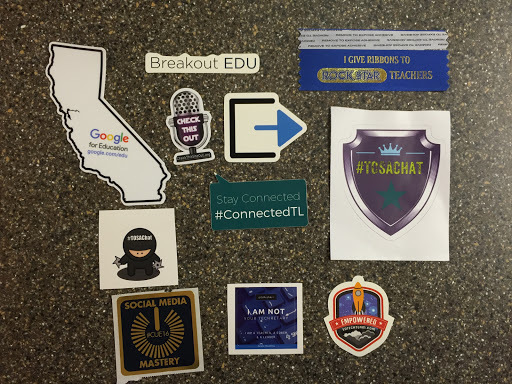 Friday was filled with some great sessions, productive learning, #FlyHighFri lunch meet-up, presenting on Genius Bar, participating in another live chat with the #TOSAchat crew, running BreakoutEDU in the unconference space, then two more great socials in the evening. Big thanks to Ari (again, because she is beyond awesome!) for organizing the BreakoutEDU games on Friday afternoon. I love watching teachers and kids play Breakout for the first time and seeing the critical thinking and problem solving in action (read my blog about my first experience with BreakoutEDU). Friday evening, I hung out with my incredible friends and colleagues at the San Diego CUE affiliate social. This was my first major CUE event as an SDCUE Board Member! I loved the opportunity to meet teachers from other areas of San Diego, and learn about their innovative ideas and projects. After the SDCUE social, I walked over to the GEG SoCal meet-up. After my incredible experience at the LA County GAFE Summit last weekend, I was so excited to meet even more great people. Saturday morning, I presented at 8:30 with Alicia, I attended a session, wandered the exhibit halls with Ari and Dan Bennett, relaxed and ate lunch, then presented my final session at 1:30. The only bummer part of my day is that I lost my MacBook charger. It was plugged in for my 8:30 session, but when I was cleaning up, I took what I thought was my charger–turned out to be not my charger and a newer Mac charger that doesn’t work with my laptop 😦 I left the charger at the Hard Rock lost & found, if anyone lost theirs. 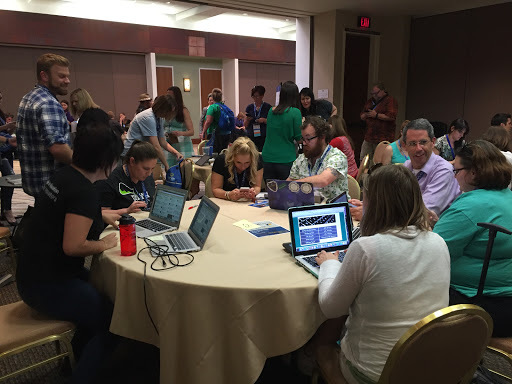 My 3rd year at CUE was above and beyond what I expected, and I can’t wait for next year! – I have the capability to be a lot more social than I think. Being a social butterfly can be fun! Some of my awesome new stickers! Time for a new laptop so I can display them all! – Sometimes it’s ok to not go to a session, and instead sit at a table and have a deep conversation with a few people. – There are a lot of amazing teachers with great ideas, and I’m one of them. I have to be my biggest cheerleader. – The learning isn’t going to stop now. I’m excited to be part of a few new Voxer groups, connected with more cool people on Twitter, and even a few potential meet-ups or Google Hangouts in the future. – Stickers!! So many stickers!! – I’ve experimented with gamification in my 7th grade science classes, and now it’s time to upgrade from the Beta version. 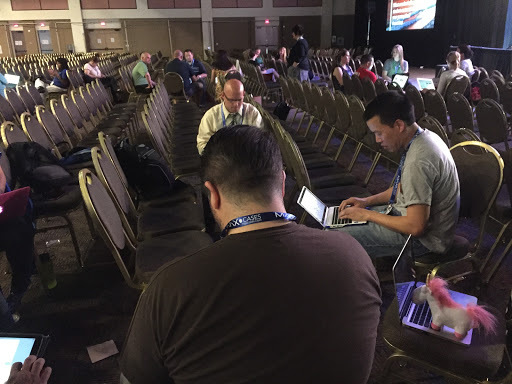 – More GAFE Summits (Imperial Valley in April! ), CUE Rockstar Vista, and ISTE! Want the tl;dr? Watch my vlog with Fluffy the Unicorn — click here for the vlog! This school year, I have a new role at school, I am the Blended Learning Specialist (tech coach) for 1 period. While this been the busiest school year for me, it has also been the most fulfilling. I know that the work I do with technology is impacting every student and teacher in the entire school. Some of the things I’ve done include creating a website, running a Twitter account, attending trainings, holding monthly parent technology trainings, and hosting weekly Tech Tuesdays at lunch. I’m thankful to work with some amazing teachers who are willing to share their knowledge and lesson ideas. I structure Tech Tuesdays to be participant-driven, and flexible based on what teachers want to learn. I have an idea of what we can talk about just in case there are no specific requests. 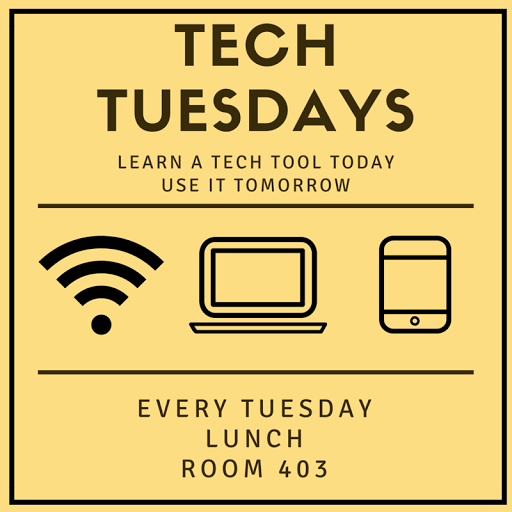 We always start Tech Tuesday by asking if anyone has a tech tool or lesson they want to know more about or would like to share. Each Tuesday, we meet in my room at lunch. Out of a teaching staff of about 40, we have had 3 to 12 teachers each week, which is an amazing turnout. There is no requirement for teachers to attend, no compensation, and no expectations for what to bring or implement. Teachers bring their lunch and we eat and talk for the 30 minute lunch period. This school year, we have also been joined by our IT professional, a student teacher, and a substitute who is finishing his credential. Our administrators have popped in as well, but they are quite busy at lunch with supervision. As the Blended Learning Specialist at my school, this is by far my favorite part of my job. I love facilitating learning for my colleagues, but also not feeling the pressure to always be the expert. If you start Tech Tuesday at your school, I’d love to hear about it!